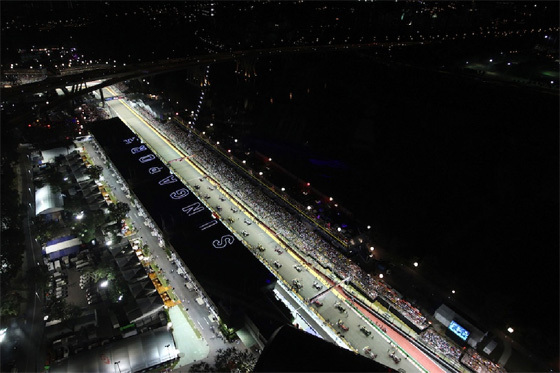 Singapore, 19 August 2011 – With just 37 days to the 2011 FORMULA 1 SINGTEL SINGAPORE GRAND PRIX, ticket sales for the region's most anticipated sporting and entertainment event, continue to be strong. All three-day Zone 4 Walkabout, Stamford Grandstand, and Esplanade Waterfront Grandstand tickets are sold out. Premier Walkabout, Connaught Grandstand, Turn 2 Grandstand and Republic (Turn 3) Grandstand tickets are also selling fast, with only limited availability. "Our unique combination of on-track race action and all-day entertainment has made the 2011 FORMULA 1 SINGTEL SINGAPORE GRAND PRIX a must-attend weekend on the social calendar," said Michael Roche, Executive Director, Singapore GP Pte Ltd. "We're delighted that fans' response to the multitude of offerings has been incredibly enthusiastic. They can take their pick from powerhouse music acts like Linkin Park, Shakira, Shaggy, Charice, Rick Astley, and Boy George to world parades, theatre productions and visual showcases." "By offering an amazing value for everyone with the price of one ticket, we're confident of delivering another spectacular sporting and entertainment experience for every ticketholder." Three-day grandstand passes are available from S$298 for a Bay Grandstand ticket to S$1,288 for a Pit Grandstand ticket. Fans can also purchase a single-day Zone 4 walkabout ticket (S$38 for Friday, $118 for Saturday, and $148 for Sunday) to catch the headliners at the Padang Stage as well as a wide repertoire of acts in Zone 4 from 23 to 25 September 2011. All ticketholders can enjoy the entertainment offerings on all three stages in Zone 4, including the Padang Stage where the headliners will be performing, as well as the Esplanade Outdoor Theatre Stage and Esplanade Park Stage. Hospitality sales are also exceptionally strong for 2011. To date, a total of 10,500 tickets have been released across the Formula One Paddock Club™, Sky Suites, Club Suites and The Green Room. All Dedicated hospitality suites as well as The Green Room at both Stamford and Turn 3, are all taken up, with very limited availability in the Shared Suites at the Pit Straight, Turn 1 and Stamford. Additionally, all seats at the Formula One Paddock Club™ are sold out, with additional requests being placed on a waitlist. Three-day hospitality packages for the event range from S$3,800 to S$8,000 (excluding GST) per person.